There's set to be another insanely expensive luxury Swiss smartwatch on the market soon with the first tech device coming from brand Hublot. The head of Hublot's parent company LVMH (also the CEO of Tag Heuer) said in a phone interview with Bloomberg that the company is set to make its first smartwatch. We know it's set to cost 5,000 Swiss francs, with a straight conversion putting it at a pricey $5,250 (£3,750, AU$6800). The company is set to only make 2,018 editions of this watch, which may justify the higher price slightly. It's not the most expensive smartwatch we've heard of though - that'd be the Tag Heuer Connected Full Diamonds which is set to cost $197,000. Hublot parent company LVMH also makes Tag Heuer watches - that's a brand that sells watches like the Connected Modular 45 and Connected Modular 41 at around the $1,550 (£1,200, AU$2,300) price mark. 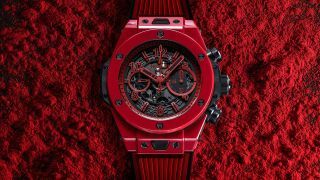 Actual spec details or the final design for the Hublot watch are currently unclear (the design in the photo isn't the new watch) and while we don't have an exact release date yet, the watch was teased to have tie-in features for the 2018 World Cup suggesting it'll be ready for the summer. The watch will let you know the results of games, scores and when teams are playing directly to your wrist, but it's unsure what functionality it'll have after the World Cup ends in July. We would assume the watch will be running Google's Wear OS software - like the Tag Heuer smartwatches - but that has yet to be confirmed. Hopefully we'll get a chance to see new Hublot watch at Baselworld 2018 later this week where TechRadar will be reporting on all the latest smartwatch announcements. Have you seen the Tag Heuer Connected 45 watch before?